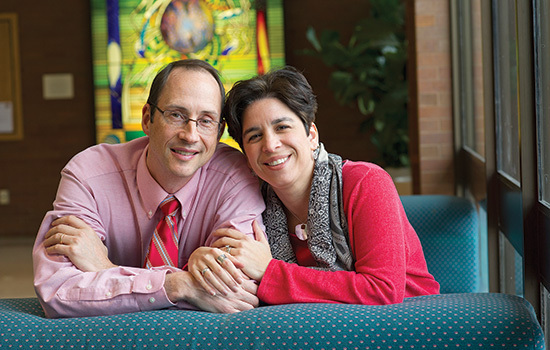 John and Loriann Macko are one of more than 20 married couples who work at NTID. Both graduated from RIT/NTID and returned to work there before dating and marrying. It’s not hard to find people with the same last name working at the National Technical Institute for the Deaf. More than 20 married couples work there. Many of them found work at NTID independently and, as in the case with Jim and Pat DeCaro, it’s a wonder love ever blossomed after their first date. and the director of NTID’s Center on Access Technology, came to NTID in 1971 to teach civil engineering technology. Meanwhile, Pat Mudgett started her career at NTID in 1970 tutoring and interpreting for biology students. “I decided it was time to get married, so I got a list of faculty here and went through the list and eliminated the married guys and it came down to three on the list,” she says. About that same time, DeCaro planned to take his class on a field trip to a sewage treatment plant and said he had room on his bus if anyone else wanted to join. “I had no idea who Jim DeCaro was, but the opportunity came up,” she says. The class interpreter failed to show up, so Pat volunteered to interpret during the trip. When they had to walk on a wooden plank over massive vats of raw sewage, Pat was interpreting, walking backwards on the plank so the students could see her signing. “Of course no one was even looking at me, they were watching where they were walking,” she says. After that first “date,” DeCaro invited her to his place where he cooked dinner, and the couple married in 1972. “It was love at first sniff,” Jim DeCaro jokes. Sam Holcomb came to NTID as a student in 1974. Barbara Ray, four years older, was already a student and a resident adviser in the dormitory. They became friends, and after graduation they took jobs teaching sign language at NTID and married. One advantage of working together: When they attend a luncheon or reception, they sit separately. “That way we get twice the news by talking with different people,” Sam says. John Macko and Loriann Laczo also attended RIT/NTID as students; he graduated from RIT’s College of Business in 1991 and she graduated from the College of Liberal Arts in 1994. Both of them landed jobs at NTID after graduation. John started in 1993 as an employment adviser and Loriann started the following year as a recruiter in the Admissions office. “We were friends two years before we started dating,” John says. The couple married in 2000. Just as they did before they were married, each drives separately to and from work on most days because they have different schedules. Loriann is now interim director of NTID Alumni Relations and has an office on the same floor as her husband. “We’re just 42 steps away from each other now,” John says. Although they didn’t meet as students, they credit NTID for bringing them together. “If it wasn’t for NTID, we would never have met each other,” John says.